Hope she doesn't feel any pain la, haha! These are the example of live-blood conditions. The example of conditions are Protein linkage, Rouleaux(Stacking), Aggregation, Uric Acid Crystals, Cholesterol Crystal and Black Crystals the worst. Unfortunately I am facing the rouleaux(stacking) condition and really need to take care of my health especially my diet. Atleast fortunately I am not facing the Black Crystal condition. This is a slice of hot chocolate cake with a scoop of cold vanilla ice-cream . It taste very good and very expensive too! If I am not wrong, it is RM 20++ per slice! After the seminar end, we all went to SAKAE to have our dinner and this is the special dish we had. 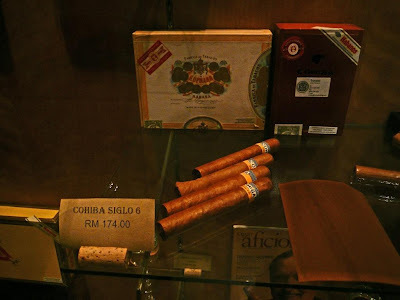 Last but not least, would you like to try COHIBA SIGLO 6? ?